Our expert malware researchers indicate that Speedtray comes from the so-called Lyrics family. Even though the services of Speedtray have nothing to do with music or song lyrics, this advertisement-supported program runs in a similar manner and might even use the same components as Searchbetter, LookaDeal, DealsWatch, Searchbetter, and other ad-supported programs that also belong to the Lyrics family and also require removal. Those computer users who do not delete Speedtray (or clone applications) are bound to encounter online advertisements that might be presented in various forms. There is no question if Speedtray will display ads. The question is ‘when?’ You might find that you need to remove banner, pop-up, and interstitial advertisements, none of which truly deserve your attention. Interaction with suspicious, unpredictable advertisements can be very dangerous, which is why we do not recommend relying on seemingly attractive offers. Speedtray can install tracking tools to record your browsing history and learn which kind of ads you might be attracted to. This might increase the chances of you clicking on ads and decrease the chances of you removing Speedtray. It is difficult to say if Speedtray is a malicious application. This adware cannot download malware or redirect you to malicious sites without permission. However, if you do not delete Speedtray, this program could expose you to potentially unreliable ads leading to sites that you absolutely need to stay away from. Due to this risk, we believe it is best to remove Speedtray as soon as possible. As soon as you delete this ad-supported program, the suspicious, questionable ads will disappear as well. Even though Speedtray is a suspicious program, its removal is quite straightforward. 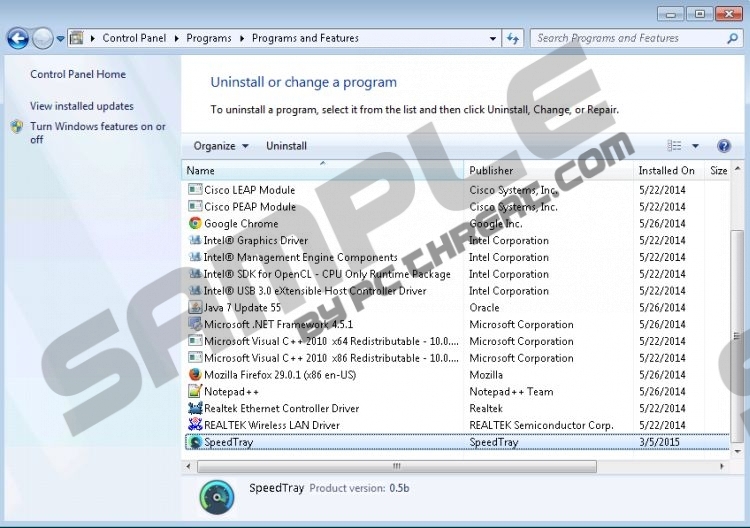 The uninstaller that you can find via Control Panel can help you delete Speedtray with just one click. Use the instructions to remove the undesirable program from your PC, and then install a malware scanner to learn if you have succeeded. It wouldn’t be surprising if the scanner found leftovers or other infections, especially in those cases when Speedtray comes bundled with third-party software. Move the cursor to the left of the Taskbar and click Start. Click the undesirable application once and select Remove. Click the Start/Windows icon located on the Taskbar. Right-click the application you want to delete. Select Uninstall and see if there are other unwanted programs. Open the Charm bar and click Search. Enter Control Panel, access the menu, and click Uninstall a program. Right-click the application you wish to delete and choose Uninstall. Quick & tested solution for Speedtray removal.